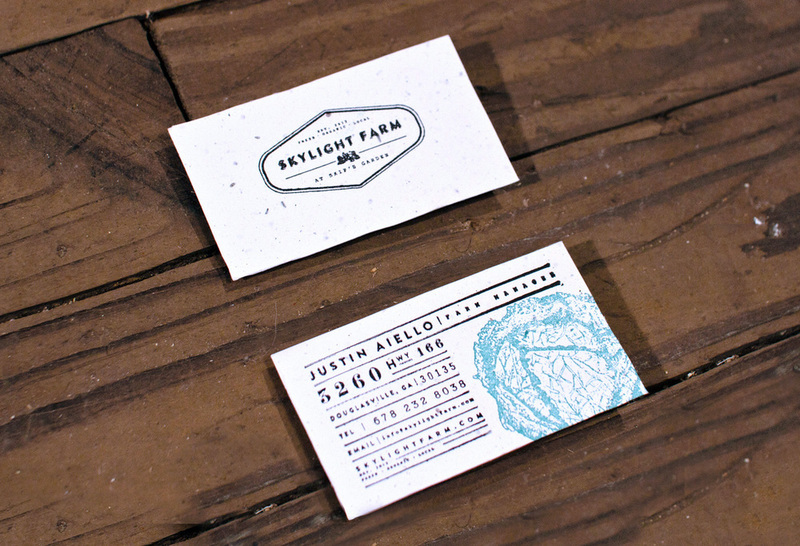 Logo design and visual branding identity created for Skylight Farm, a certified naturally grown farm in the Atlanta metro area, designed by freelance graphic designer Russell Shaw. About Skylight Farm: Skylight Farm at Skip’s Garden is a biodiverse, organic vegetable farm located just outside of Atlanta. Everything produced at Skylight Farm is of the highest quality and Certified Naturally Grown. About the Design: The brand identity was inspired by vintage farm labels and features original hand-drawn illustrations of vegetables and farm equipment. All of the print collateral is on 100% recyclable seeded paper, so that each customer who receives a card or a note from the farm is able to further Skylight’s work by replanting the paper and growing their own garden. Whether you are a good food aficionado, passionate about caring for the environment, or simply excited about supporting local businesses, Skylight Farm grows for you. Keep the Farm Growing: The print collateral uses 100% recyclable papers that are peppered with seeds and entirely plantable. From the passing of a business card to the receiving of a Thank You note, each customer is able to actively participate in the re-telling of the brand’s story by planting the paper. The business card design allows for any of the vegetable wood block stamps to be applied to the corner and create a diversity of card designs.